A tough and rugged image is what you have always portrayed. 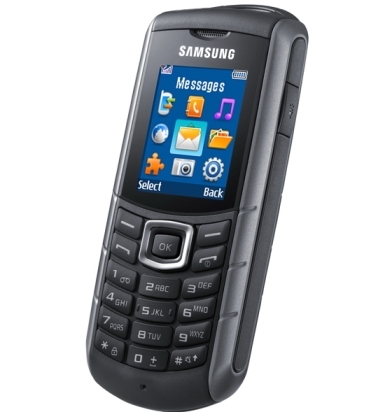 Smart, reliable and not afraid of getting dirty… Samsung’s Xcover E2370 is therefore the cellphone for you. Minus the frills and sophisticated functions, Xcover is nevertheless equipped with the bare essentials. It is incorporated with Bluetooth, FM radio, and VGA camera. It also features a 160 x 128 pixel resolution screen, 5 MB of memory, and a max 2GB MicroSD card support. The phone battery can last for about two months on standby mode and about 22 hours in talking mode. If you need to be away for long stints without recharging your battery, the Xcover will be very handy. Weighing 115g and measuring 19mm thick, the cellphone is bulky by normal standards. But you can drop it or take it with you on the most adventurous journey and the phone will survive the rough handling intact. Certified to be dirt and splash resistant, the Xcover is one tough and resilient cookie.